Vinegar is said to be the first seasoning created by man and is believed to have been in existence as long as salt. The origin of the word vinegar is "vin aigre", meaning sour wine. Vinegar is made in two steps of fermentation process. Firstly, alcohol is made from grain or fruit, then secondly Acetobacter changes the alcoholic substance oxidized. Therefore, wherever there is alcohol, there is always vinegar. 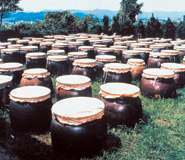 There are many popular kinds of vinegar; rice vinegar from Japan, malt vinegar from England, and wine vinegar from France. MUSO produces superb slow processed vinegars made only from organically grown high quality ingredients. The simple sour taste and aroma of these vinegars accentuate any dish of choice. Most of all, vinegar helps improve our lives and health in many ways. MUSO, therefore, is proud to make available their top quality vinegar all over the world.